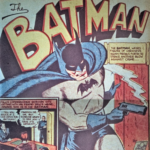 The “gadgeting” of Batman continues in Detective Comics #37 (February 1940) with Bruce adding a night-vision device to let him see in the dark. 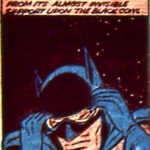 Note that this is only a couple months after Germans started experimenting with nightvision goggles in World War II! 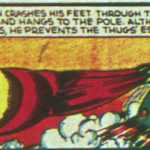 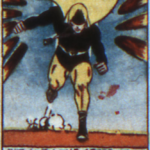 The Spectre‘s costume was revealed in-story during More Fun Comics #53 (February 1940). 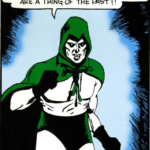 The original setup was that Detective Jim Corrigan is dead, but still walks the earth, and he made the costume in order to fight crime. 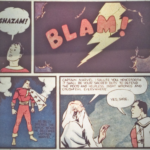 The first superheroine is largely considered to be Fantomah, a woman with supernatural powers who appears in Jungle Comics #2 (January 1940). 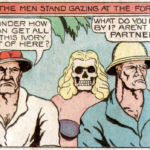 She leads these ivory raiders to their deaths, so she is more of an anti-hero in my opinion. 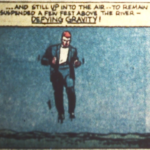 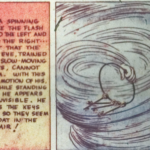 The Flash gained a new power in Flash Comics #3 (January 1940) by learning how to vibrate rapidly to appear invisible! 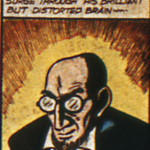 Speaking of bald, evil geniuses with misshapen heads, Batman gets his own version with Hugo Strange in Detective Comics #36, January 1940.